Wealden Astronomers: The next meeting of the Wealden Astronomers will be at Herstmonceux Village Hall on Friday 3rd May 2019 at 7.00 for 7.30 PM. The next meeting of the Wealden Astronomers will be at Herstmonceux Village Hall on Friday 3rd May 2019 at 7.00 for 7.30 PM. 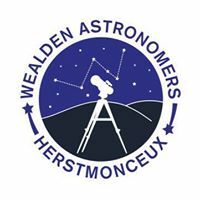 The next meeting of the Wealden Astronomers will be at Herstmonceux Village Hall on Friday 3rd May 2019 at 7.00 for 7.30 PM - Tea, Coffee & Biscuits. The speaker for this evening will be Mr Antonis Papanestis who will give a talk on Antimatter.